Dr. Georges Viau [1855-1939], Paris; (his sale, Paris, 21 March 1907, no. 68); purchased by (Bernheim-Jeune, Paris) for an unknown buyer. Alexandre Berthier [1883-1918], 4th Prince de Wagram, Paris; sold probably by his heirs though (Canadeesche Hypothek Bank) through (Étienne Bignou, Paris) to (Alex Reid & Lefèvre, London); on joint account with (M. Knoedler & Co., London, New York and Paris) and (Marcel Kapferer);  sold 25 November 1929 to (Etienne Bignou, Paris and New York);  sold 16 January 1933 to to Chester Dale [1882-1962], New York; bequest 1963 to NGA. Reid & Lefèvre Paintings Sold, sheet no. 198, #2/29 B1394 gives acquisition source and partial share information (Lefèvre archives, Hyman Kreitman Research Centre, Tate Britain, TGA 2002/11, Box 283). An annotated photograph of the painting is included in the Bignou photo albums at the documentation center of the Musée d'Orsay (copy NGA curatorial files). Painting Stockbook no. 5, London 1928-1939, and Stockbook no. 8, New York, no. A614. M. Knoedler & Co. Records, Getty Research Institute (Copy, NGA curatorial files). Exposition A. Renoir, Galeries Bernheim Jeune et Fils, Paris, 1900, no. 40 as Diane chasseresse. The Classical Period of Renoir, M. Knoedler & Co., New York, November 1929, no. X. From Impressionism to Modernism: The Chester Dale Collection, Washington, National Gallery of Art, January 2010-January 2012, unnumbered catalogue, repro. Meier-Graefe, Julius. Auguste Renoir. Munich, 1911:8-9, repro. p. 11. Meier-Graefe, Julius. Renoir. Paris, 1912: p. 7 repro. Vollard, Ambroise. Tableaux, Pastels & Dessins de Pierre-Auguste Renoir. Paris, 1918: p3, repro. 372. André, Albert. "Renoir." Kunst und Künstler. Berlin, 1920: repro. p. 474. Duret, Théodore. Renoir. Paris, 1924: repro. plate 2. Coquiot, Gustave. Renoir. Paris, 1925: 223. Vollard, Ambroise. Renoir: An intimate Record. New York, 1925: 38. "A Renoir Exhibition." The Burlington Magazine 55, no. 320 (November 1929):252, repro. Meier-Graefe, Julius. Renoir. Leipzig, 1929: 20-22, repro. p. 17, no. 3. "Chicago Show to Present French Modern Classics." Art News XXXI, no. 34 (May 20, 1933):repro. p. 1. Barnes, Albert C. and Violette de Mazia. The Art of Renoir. New York, 1935: no. 4. Bertram, Anthony. August Renoir. London, 1935: repro. plate I.
McBride, Henry. "The Renoirs in America: In Appreciation of the Metropolitan Museum's Exhibition," Art News 35, no. 31 (1 May 1937):60, repro. Florisoone, Michel. Renior. Paris, 1938: 16. Wilenski, R.H. Modern French Painters. New York, 1940:18-19. French Paintings from the Chester Dale Collection. National Gallery of Art, Washington, 1942: 61, repro. Drucker, Michel. Renoir. Paris, 1944:17, 29, 111. French Paintings from the Chester Dale Collection. National Gallery of Art, Washington, 1944: 61, repro. Rewald, John. The History of Impressionism. New York, 1946: repro. 146. A Loan Exhibition of Renoir for the Benefit of the New York Infirmary. Exh. cat. Wildenstein, New York, 1950: 24. Pach, Walter. Pierre Auguste Renoir. New York, 1950: 36, repro. Fox, Milton S. Renoir. New York, 1952: 9, repro. Berr de Turique, Marcelle. Renoir. Paris, c. 1953: 5. French Paintings from the Chester Dale Collection. National Gallery of Art, Washington, 1953: 71, repro. Rouart, Denis. Renoir. Geneva, 1954: 18, repro. Fosca, François. Renoir, His Life and Work. London, 1961: repro. 11. Rewald, John. The History of Impressionism. 3rd rev. ed., New York, 1961:repro. p. 166. Eighteenth and Nineteenth Century Paintings & Sculpture of the French School in the Chester Dale Collection, National Gallery of Art, Washington, 1965: 107, repro. Fezzi, Elda. L'opera completa di Renoir nel period impressionista. Milan, 1972: no. 20. Champa, Kermit S. Studies in Early Impressionism. New Haven and London, 1973: 43, 44-49, 83, repro. Rewald, John. The History of Impressionism. New York, 1973:1965, repro. 166. Fouchet, Max-Pol. 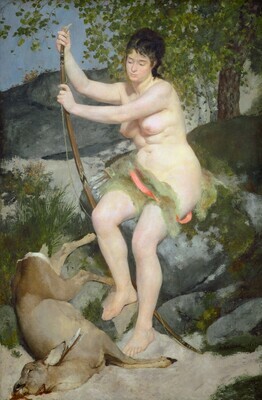 Les Nus de Renoir. Paris and Lausanne, 1974:67, repro. 66. European Paintings: An Illustrated Summary Catalogue. National Gallery of Art, Washington, 1975: 294, repro. Bellony-Rewald, Alice. The Lost World of the Impressionists. Boston, 1976: 44. Walker, John. National Gallery of Art, Washington. Rev. ed. New York, 1984: 469, no. 684, color repro. Arts Council of Great Britain. Renoir. Exh. cat., Hayward Gallery , London, Galleries nationales du Grand Palais, Paris, and Museum of Fine Arts, Boston, 1985-1986:180, repro. European Paintings: An Illustrated Catalogue. National Gallery of Art, Washington, 1985: 339, repro. Rouart, Denis. Renoir. Rev. ed., New York, 1985: 12, repro. 13. Kopper, Philip. America's National Gallery of Art: A Gift to the Nation. New York, 1991: 8, color repro. Roos, Jane Mayo. Early Impressionism and the French State (1866-1874). Cambridge, 1996: 84, fig. 63. Sagner-Düchting, Karin. Renoir: Paris and the Belle Epoque. Munich, 1996:22, repro. 23. Druick, Douglas W. Renoir, Chicago, 1997, p. 19, no. 7, repro. Kelder, Diane. The Great Book of French Impressionism, 1997, no. 214, repro. Pitman, Dianne W. Bazille: Purity, Pose, and Painting in the 1860s. The Pennsylvania State University Press, 1998: 58-60, repro. no. 29. Hand, John Oliver. National Gallery of Art: Master Paintings from the Collection. Washington and New York, 2004: 378-379, no. 312, color repro. Dauberville, Guy-Patrice, and Michel Dauberville. Renoir: Catalogue raisonné des tableaux, pastels, dessins et aquarelles. 5 vols. Paris, 2007: 1:no. 578.